A blueprint is a detailed technical design or building plan. Other than a landscape, that is high-level for communication purposes, a blueprint contains detailed information for engineering purposes. A blueprint is not meant to be a communicative visualization. It may of course act as one. We have created a service for you, that if you want, we can create a blueprint for you, and you and your team members can give feedback anytime, anywhere via the Content Viewer on your iPad and Smartphone. The Dragon1 Platform and its specialized tools enable close collaborations between us, like the Architecture Repository, Visual Designer and Assets Catalog. We will first create a project or campaign together with a deadline and plan the activities or schedule the tasks to execute on the Dragon1 Platform. You will then collect the necessary and available data, for instance, in an Excel sheet. Next, we will upload the data automatically and enrich the data manually. Then we will build a visual blueprint using the data and you will comment on the blueprint visualization. We will iterate this cycle four or five times in two of three weeks. In the Architecture Repository we will upload and import the data. And we will show you how to do it yourself. At any time you can take over this work if you like or want. In the Visual Designer we will build a model using the data, build a view and visualization on top of the model. And as with the Architecture Repository, we will show you how we do that. Also, the Dragon1 Help and Learn System explains thoroughly how you can make use of the enterprise architecture software. As we provide you with literally everything you need to eventually be able to do it yourself. In the Content Viewer you will watch the published intermediate versions of the blueprint and be able to comment it. Also, there are many features to handle the blueprint: filter data, select data, view the changes made and message directly to people part of the workflow for the product. Often a blueprint is part of a bigger plan. If you prefer you can create in time all the architecture deliverables on the Dragon1 Platform, working with a single source of truth, thus increasing the quality of data you use. 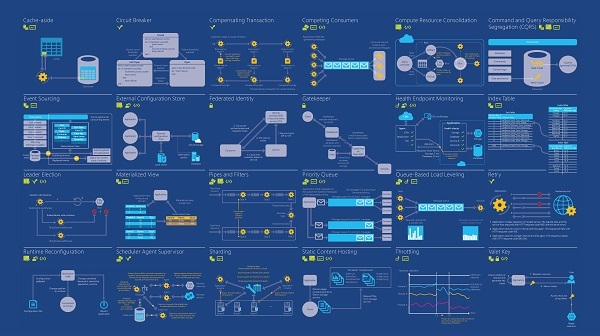 Derived from the blueprinting service we offer a business modeling service. Many small business entrepreneurs that want to consider using Dragon1, want to use it for business modeling. But it can take a lot of time if you have to start this journey on your own. If you call us and explain to us how your business model looks like and what you want to use the diagram for, we can save you a lot of time. Dragon1 PRO and Dragon1 ENTERPRISE users have access to the templates. These templates speed up the work for creating a complete enterprise architecture significantly. Are you interested in our blueprinting service, please call us at +31(0)317 411 341 or mail sales@dragon1.com. 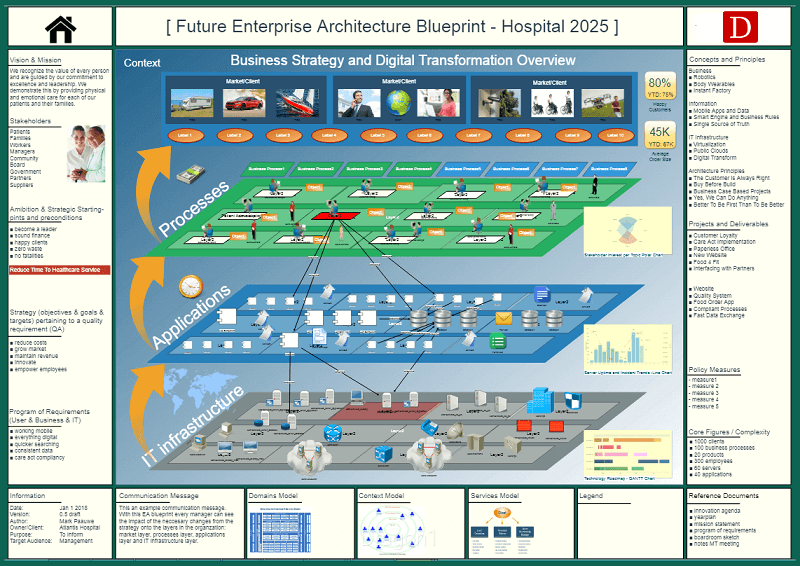 You can also purchase the IT Infrastructure blueprint, layered EA blueprint or Capability Roadmap in the Dragon1 Store. We will contact you asap to discuss what detailed approach best fits your needs and situation. This is an example screenshot of a technology blueprint. 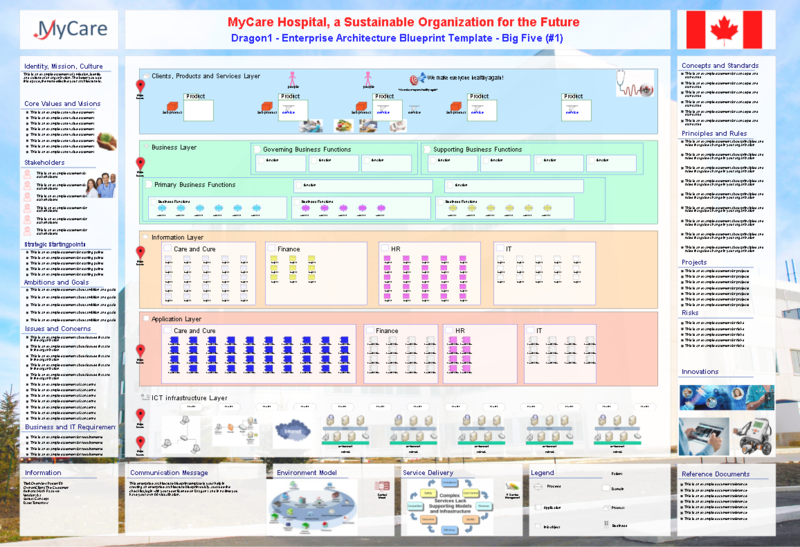 This is an example screenshot of a template of an Enterprise Blueprint (Big Five 5, #1). 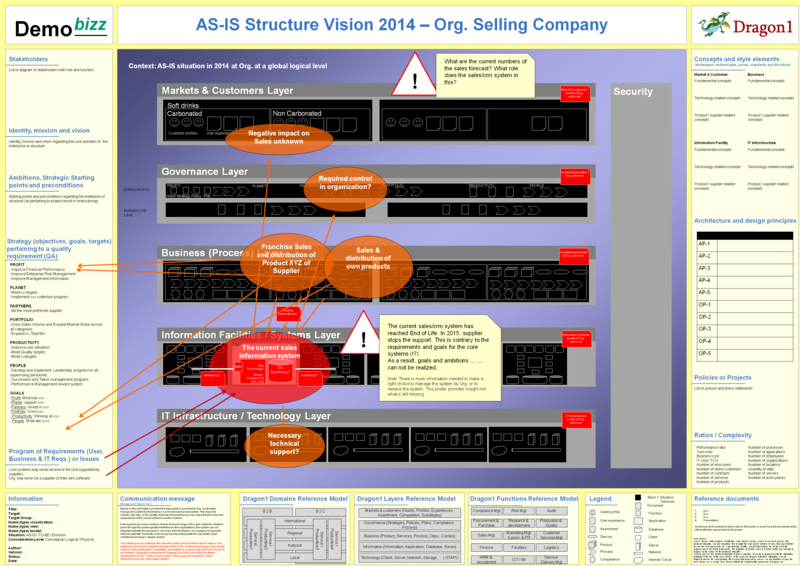 This is an example screenshot of an enterprise architecture blueprint.